While I have a very good memory for names and historical facts my memory for remembering lines has always been very poor. I recall my days at St. Ed’s High School in Austin, Texas when Brother Edwin Reggio, C.S.C. would tell us at the end of the class that if we remembered the day’s gospel by heart for the next we would get 10 extra points. I was always doomed for failure in this. I was extremely jealous of my friend Howard Houston who could and would memorize anything on sight. He always got those 10 extra points. In school plays I was profoundly afraid of being asked to participate in any kind of play. To simply stand up on a stage and recite lines was to me the most fearsome kind of activity. Luckily, since I was in the school band (I played the alto saxophone) I could stay out of trouble by providing musical accompaniment for Brother Dunstan Bowles's, C.S.C. school plays. One in particular I have a fond memory for since it was The Nutcracker and I had to learn to play Tchaikovsky which for me was quite a challenge. My saxophone was, at most, efficient. My fond memory is that one of the females in the cast was Judy Reyes (a 5 ft tall cheerleader who was stacked). I admired her from afar. All this avoiding of memorizing lines ended one day. 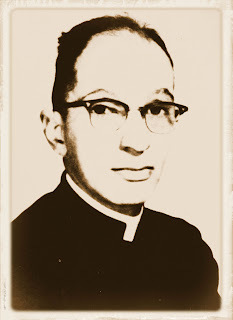 I suspect that the librarian (very German he was) Brother Myron Bachenheimer, C.S.C. was the man responsible for my sudden travails. Brother Myron was the school librarian. He wore a cape and hat and walked with an umbrella or cain. Most thought he was a creature of the undead. But I had resorted to his help when Brother Dunstan had warned me he would fail me in his English Lit class if I did not improve my handwriting. He told me he could not read anything I handed in. Brother Myron had suggested that if I learned to write with Italic pens my handwriting not only would be legible but beautiful, too. He dispatched me to town on a weekend to buy two Italic nibs. One was for red ink for the capitals, the other for black for the rest. Soon my essays that I presented to Brother Dunstan resembled medieval manuscripts. I learned to like Brother Myron who one day told me that I had a passing resemblance to Hitler even though my ears stuck out a bit too much. I did not know how to take this. Was this a compliment or an embarrassing insult? I soon found out that there was more to this. A few days later Brother Dunstan informed us that there would be a new school play. It was an unusual play by a now obscure Italian writer called Edmondo De Amicis. He had written a play, only recently having been translated by our polyglot Brother Myron (aha!) from Italian into English. 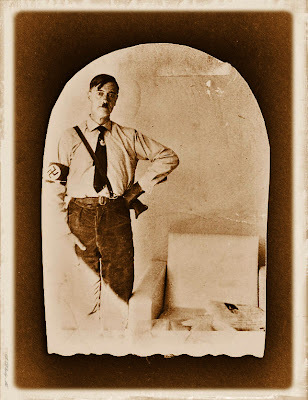 The play was called Hitler - The Young Philosopher. Looking into my direction Brother Dunstan informed me that I was going to play the lead part. All I will reveal here is that what followed was a month of hell where every night I would stay awake to remember lines. There was a love interest in the play, a young girl who coincidentally was called Eva. Would you believe that they cast my Judy Reyes for the part? It made my memorizing of lines and declaiming on stage all the more difficult as every time I happened to look at her I could feel my face burning. In those days I easily blushed. Now I am not bragging as I don’t think anybody should ever brag about playing Hitler. I did. And in the end I remembered all my lines. And I had a couple of dates with Judy, my first ever dates with a girl. I had successfully gone from being a nerdish wall-flower to a young man who would shuffle in my socks on the basketball gym with my 5 ft bombshell of a girlfriend to the tune of A Summer Place which then was the ultimate slow dance to hold on tight.